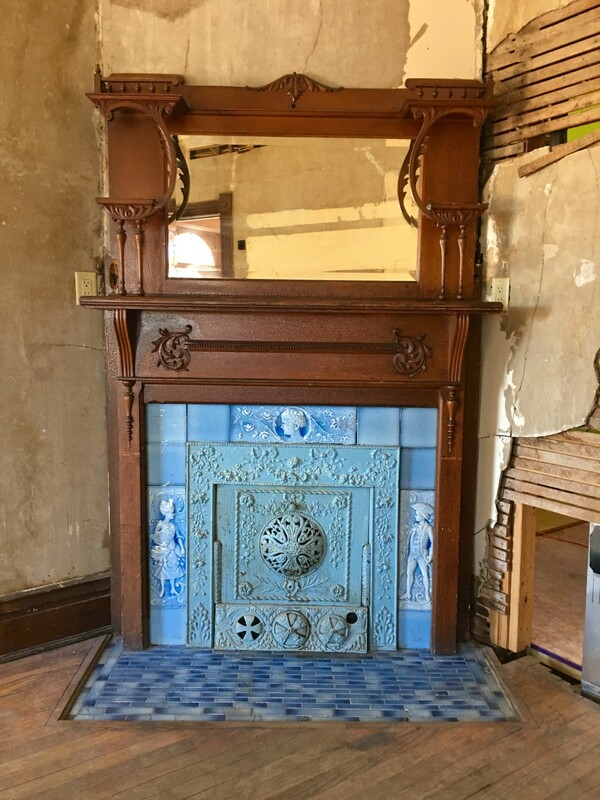 …to complement the blue tiles of the fireplace surround. Later however I realized that the house originally had gas/electric combination fixtures, so the blue beauty (all electric and about two decades later than the 1894 Cross House) was put in storage. And there it has sat, lonely and forgotten, until I hauled it out and restored it. It is now very happy! 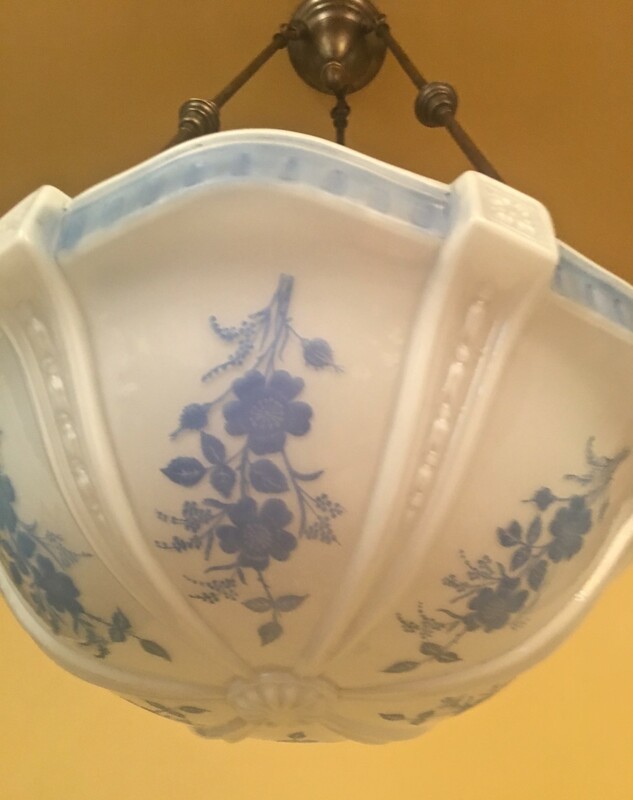 The white glass shade has beautiful blue roses, and is an impressive 16-inches wide! 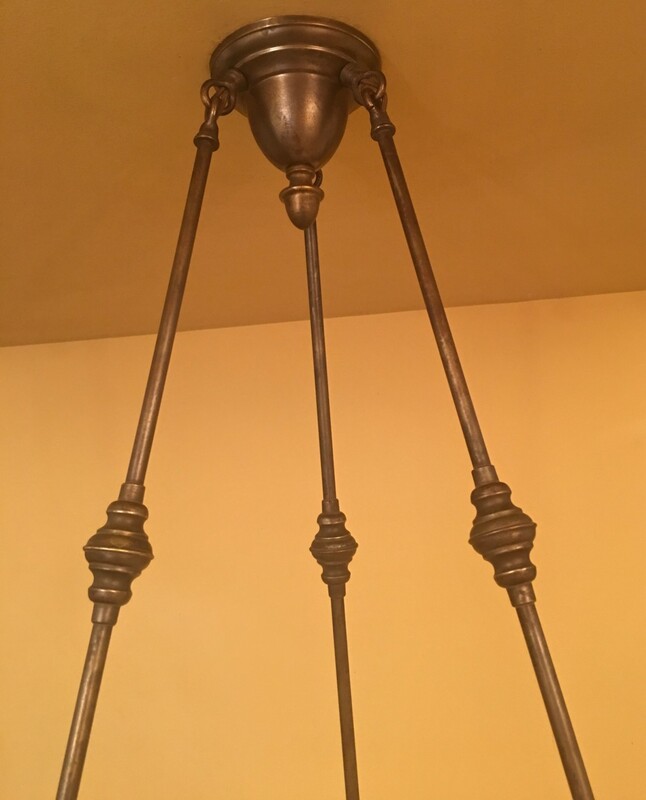 I also love the detailing on the three brass hanging rods. 12 Responses to A Blue Beauty! Wow, that is a nice one! 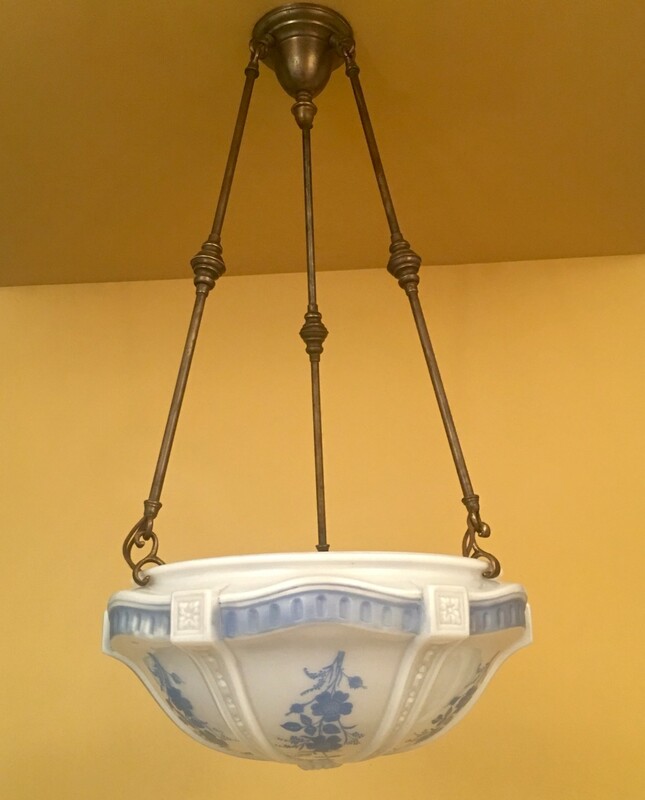 If I’m not mistaken, that would look very nice in a Colonial Revival, perhaps a foyer or stair hall? The shade is large (16-wide) so it would also look good, say, over a dining table. Ah, yes, certainly. That is a generous size! The pan-style fixture I installed in our dining room has a large center glass bowl in addition to four hanging sockets at the perimeter. The center glass illimates the table perfectly. The nice thing about the open bowl shades like yours here, is they also provide upward lighting that can reflect off the ceiling, providing very nice indirect light evenly throughout the room. I have been looking for some time for a matched set of blue shades for the gas/electric chandelier now in the round bedroom, and despair of ever finding them. And of affording them! Well, if I weren’t so attached to my own set of blue shades, I’d gladly send some your way, but you’re right, they’re SUPER hard to come by. Took me well over 6 months to amass my set of 8 matching, and 6 blue gas candle slips. What does the round bedroom fixture look like? Dearest Mr Ross. Today I stopped at Your Cross House. What a spectacular amazing job you have done with the restoration. Yes my husband schlepped me across the country just to see it. What an astounding display of perfection. Your house is stunning. Thank you truly for restoring this gem of architecture. This made my trip across country so worth it!! I am at the house almost daily. But not today! Argh! I am sorry we did not have the opportunity to meet. 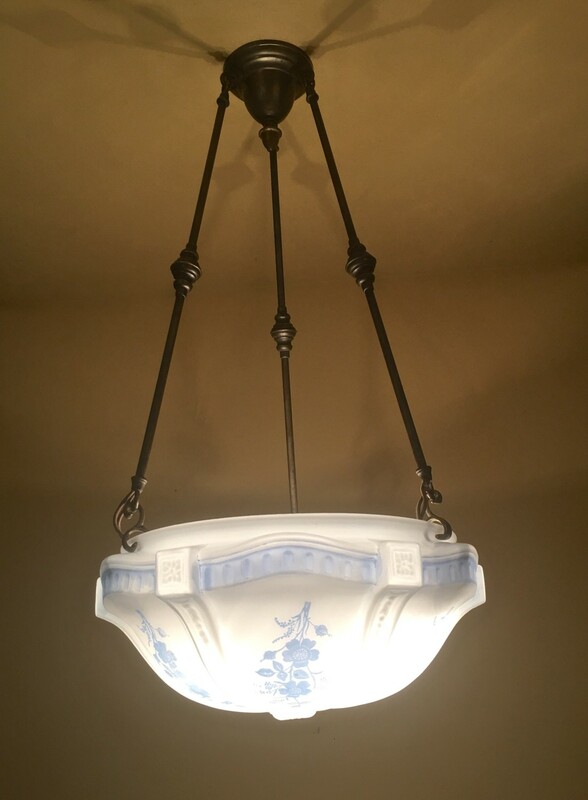 Do you still have the fixture & won’t it still work in the blue bedroom?? I love that room & I love this vintage light. I wish it somehow could be used. It is so stunnng! This is one of my favorites & the Markel fixtures the others!! Hi, Sandra! Alas, I sold the blue fixture!